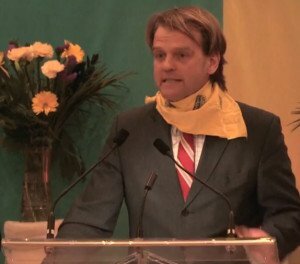 Canada’s minister of immigration and citizenship, Chris Alexander, was one of the featured speakers at a fundraising dinner in Toronto on February 22, 2015 organized by the extreme-right Ukrainian Canadian Congress. The minister delivered a pro-war rant that could easily serve as dialogue in a film sequel to the 1964 doomsday-nuclear war film, ‘Dr. Strangelove’. Alexander told the audience that “every” military option must be exercised in the process of giving a “comeuppance” to Russian president Vladimir Putin. Of note in the minister’s speech is the threat to move against RT.com and other news services out of Russia, “which are preaching absolute poison”. The aggressive tone of the minister was no doubt occasioned by the presence of the principal guest speaker at the dinner–Andriy Parubiy. He is a deputy chairperson of the Ukrainian parliament. He was a founder of an important organization of the extreme right in Ukraine back in 1991, the Social-National Party of Ukraine. 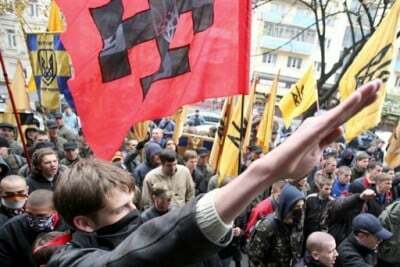 The party became a fount of future extreme-right formations, including today’s Svoboda Party. Parubiy was also a ‘commander’ of the far-right shock troops which seized the leadership of the protest movement called ‘Euromaidan’ in Kyiv in late 2013 and early 2014. The violent actions of the extreme-right on Maidan Square in Kyiv sparked the overthrow of the elected president Viktor Yanukovych and the commencement of the civil war by the new government against the people of eastern Ukraine. The dinner was attended by several hundred people. Parubiy travelled to Ottawa the next day where he was feted by the Conservative Party government of Prime Minister Stephen Harper. The shock troop commander received a warm welcome from Canada’s minister of foreign affairs, Rob Nicholson, and from many members of Parliament. Below is a transcript of excerpts of Chris Alexander’s four-minute speech to the Toronto event. His speech can be viewed (beginning at the 10′ mark) as part of a one-hour Ukrainian-language news program, ‘KontaktUkrainian TV2′, published here on You Tube. The program episode was posted to YouTube more than two weeks ago and has garnered a mere 71 viewers. 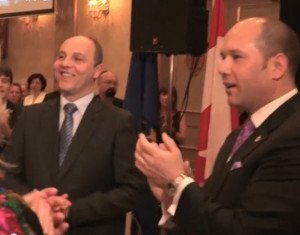 It includes portions of Andriy Parubiy’s speech to the dinner as well as a nine-minute interview with him. Chris Alexander and other political leaders in Ontario attended a Ukrainian Independence Day event in Toronto last August 24, 2014 which featured fundraising booths of the Ukrainian fascist party ‘Right Sector’. The group was raising funds for its paramilitary battalion in Ukraine. 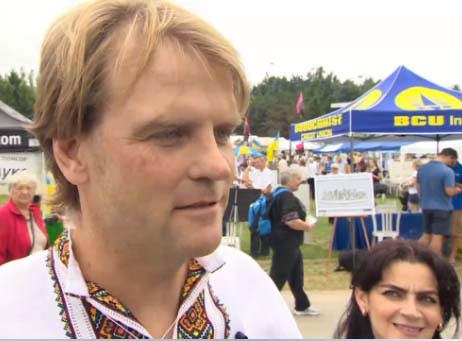 When asked by reporters of CBC’s English and French-language services if he was aware of the Right Sector’s activity at the event, Alexander bristled and said he was “very proud” to be in attendance. That event was organized by the Ukrainian Canadian Congress. The same group organized a gala event in Toronto on November 29 to mark the one-year anniversary of the Euromaidan movement. The guest speaker there was Valeriy Chobotar, a leader of the Right Sector brought all the way over from Ukraine. We know, as you know, that Vladimir Putin is only going to face his comeuppance, that his whole, mad nightmare is only going to come apart at the seams, when the whole world is standing against him, with every option [speaker emphasis] on the table, denouncing his illegal action and standing with Ukraine. With military assistance, and with every other form of assistance. All of our democracies, all of our democracies, depend on the outcome of this struggle. This is going to be a great struggle. We are just at the beginning of this struggle. When I see groups like this assembled… I know that the future of Ukraine is still bright. I know that the times that bring Canada to Ukraine have never been stronger.